Four months ago, on October 18, 2009, nearly 600 people laced up their running shoes and participated in the Metropolitan Police Department of Washington, DC's 2nd Annual "Race to Remember." The event supports the Memorial Fund's efforts to build the first-ever National Law Enforcement Museum in Washington, DC. Pictures and winners from the 2009 race can be found here: http://nleomf.blogspot.com/2009/10/race-to-remember-2009.html. 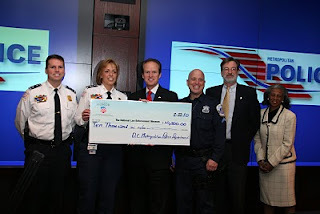 On Monday, February 22, 2010, Memorial Fund Chairman & CEO Craig Floyd, along with staffers Kevin Morison and Mary Brown, visited MPD headquarters to thank the MPD and Fraternal Order of Police, DC Lodge #1 for successfuly organizing the event and supporting the Museum. Chief of Police Cathy Lanier, Assistant Chief Pat Burke, and Marcello Muzzatti, DC Lodge #1 President, presented the Memorial Fund with a check for $10,000, bringing the MPD's total contribution to $20,000. The Memorial Fund again thanks all of the Race to Remember participants and the generous sponsors and supporters: the Fraternal Order of Police Metropolitan Police Labor Committee, Police Federal Credit Union, EAS Myoplex, and GOSmart Pocket Pedometers by Omron. When the weather turns ferocious, as it did in the Mid-Atlantic region this past week, most of us have the option of leaving our cars at home and staying off the roads. But not the men and women of law enforcement. Case in point: the dedicated troopers of the Virginia State Police. As most parts of the Commonwealth were getting pummeled by close to three feet of snow in back-to-back blizzards, Virginia’s troopers were out in force, risking their own lives to ensure the safety of those who had decided to venture out. During the first storm, from Friday, February 5, through Sunday, February 7, Virginia State Police emergency dispatchers logged more than 5,200 calls for service. Troopers statewide responded to 1,921 traffic crashes and 2,098 disabled vehicles over the three-day period. And during Mother Nature's second blast, from Tuesday morning, February 9, through Thursday morning, February 11, troopers responded to another 732 traffic crashes, with more than 100 of them involving injuries. This heroic level of service did not come without some sacrifice, however. Since the weekend, 11 troopers have been struck by out-of-control vehicles, and four have suffered minor injuries, according to Sergeant Thomas Molnar, a State Police spokesman. He said several other troopers were injured in other weather-related incidents. It is almost miraculous that no troopers were more seriously injured or killed during this historic weather event. Such statistics serve as a reminder to all motorists, especially those driving in treacherous weather: slow down and watch out for law enforcement and other emergency vehicles on our roadways. It’s not only common sense; it’s also the law in Virginia and 46 other states that have adopted “Move Over” statutes. Day in and day out – regardless of weather conditions or other challenges – the men and women of law enforcement do amazing things for the safety and protection of others. In times like these, all of us owe these heroes two things: 1) our deep gratitude and 2) our commitment to watch out for them while we're driving, so our officers can get home safely as well. Learn more about what you can do to keep officers safe on our roadways by visiting the NLEOMF Drive Safely website. One of the best parts of my job is traveling the country and meeting with the men and women of law enforcement. This past week took my colleague Anne Kringen, Law Enforcement Relations Associate, and me to the state of Idaho. We had been invited to speak at the Idaho Sheriffs’ Association’s Winter Conference. Knowing that we were coming to Boise, we scheduled meetings with law enforcement leaders in the area. One specific meeting reminded me just how important our work at the NLEOMF is to our nation’s law enforcement community. The meeting was with Chief James Bensley of the Garden City Police Department a suburb just north of Boise. Chief Bensley greeted us and listened closely as we discussed the NLEOMF, upcoming National Police Week plans, our latest Research Bulletin and current trends in line of duty deaths. The chief shared memories of visiting the Memorial while attending the FBI’s National Academy and how important he felt the memorial is. We also shared the National Law Enforcement Museum campaign, “A Matter of Honor,” and how it will tell the stories behind the badge and help to educate the public about the history, the service and the sacrifice of America’s law enforcement profession. Chief Bensley listened intently, expressed his support for the project numerous times, and said he would be happy to help out. Toward the end of the meeting Chief Bensley asked, “Can I show you something?” “Of course,” we replied, and we got up and exited the conference room and headed to the back parking lot. I started to wonder, what could he want to show us out here? They might have a memorial, but they have not lost any officers. Now, I was curious. We approached several police cars parked there and a crime scene van. 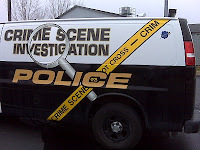 My first reaction was to the crime scene van with crime scene tape painted on the side. “Wow, that’s cool,” I thought. 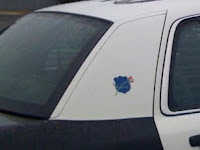 The chief said, “Look at the side of the patrol cars, and the upper corner of the van.” Chief Bensley said with great pride, “Every one of our cars has the Rose & Shield proudly displayed.” Now, I was really wowed! In fact, I was speechless, which is a place I rarely find myself, and remember thanking the chief over and over again. What an incredible tribute to the service and sacrifice of all of America’s law enforcement heroes. As we left the department, still filled with pride with what we just experienced, I turned to Anne and said, “That really says a lot about what we represent.” Imagine being in a relatively small community, some 2,300 miles from the Memorial, and every car on the police department bears the NLEOMF’s Rose & Shield. That really hit home, deep in my emotions, and I was able to reflect on the honor everyone at the NLEOMF has and the respect we share for the service and sacrifice of each and every police officer, sheriff’s deputy, corrections officer, state trooper and special agent that make up America’s law enforcement profession. As always, thank you Chief Bensley and the men and women of the Garden City Police Department for your dedicated service to your community. Be Safe. Citing officer safety as a prime benefit, the Prince George's County (MD) Police Department recently announced it is switching to E-TIX (Electronic Traffic Information Exchange) for issuing speeding and other traffic citations and warnings. Using bar code information from a driver's license, E-TIX accesses the driver's personal and driving history information, and prepopulates citations with that data. This not only reduces the number of illegible, hand-written tickets, but also enhances officer safety. "It's going to reduce the amount of time that officers spend on the side of the road, which is quite often a safety hazard to both the officer and the potential violator," Prince George's County Police Sgt. Michelle Reedy told WTOP Radio. The E-TIX system was created in 2006 by the Maryland State Police. More than 35 agencies currently use the system in the state of Maryland. More information about the switch can be found here, http://www.wtop.com/?nid=708&sid=1875431 and here, http://www.wusa9.com/news/local/story.aspx?storyid=96601. Honor: Earned, Never Given -- A Tribute to the "Midnight Piper"
A Memorial Fund staffer passed along this email from Sergeant Dan Foley, of the Wyandotte (MI) Police Department, sharing his memories and condolences about the passing of Jimmy O'Connell, the original "Midnight Piper." Sgt. Foley runs one of the largest Honor Guard training schools in the country and is active at the Memorial each year during National Police Week. How sad. Can't begin to express how special of a tribute and tradition this has become, and until now, I never knew the full explanation of how it came to be. The closing services, midnight at the Memorial is possibly, at least for me and my wife, one of the most special times during our entire week while there in Washington during National Police Week. For some it is the Vigil, for others it is the Capitol services, but for all their pomp and circumstance there is something about this brief and solemn service at closing that really hits home. It matters not what we are doing, where we are at or the weather, come 11:45 pm, we will be at the Memorial to pay our final respects. Something about the Memorial at night, the peacefulness, the soft glow of candles and accent lighting, the tributes left, the sound of the reflecting pool, it's a place of reflection, a place of healing, and a place of honor. And then the sounds of a lone piper as only the sounds the bagpipes can provide will slowly become stronger as he enters the Memorial; passing each and every name on each and every panel until he slowly walks off in to the dark night and the mournful music becomes ever so faint. For me it never fails, and I am not ashamed to admit it; but it always comes with tears. Maybe it is the conclusion of a year's worth of planning or a week's worth of mixed emotions; tributes, honor, camaraderie, the realization that the week has once again ended, and the uncertainty of what the future will hold for all of us. Will we see each other again next year? Maybe it is a renewed understanding of just how fortunate I am after my own near death experience of possibly having my name added to one of these panels, and as I sit with my wife I realize just how fortunate I am to have had her support during that time. I do know one thing. It makes you extremely proud. This simple and yet lightly attended service of a lone piper giving his final tribute. To have been allowed to serve and to be part of possibly the greatest fraternity known to man. Law Enforcement. The names on these walls have earned this honor and tribute. We never just "give" it, and while the tradition will be carried on, it is sad to know the originator has passed.